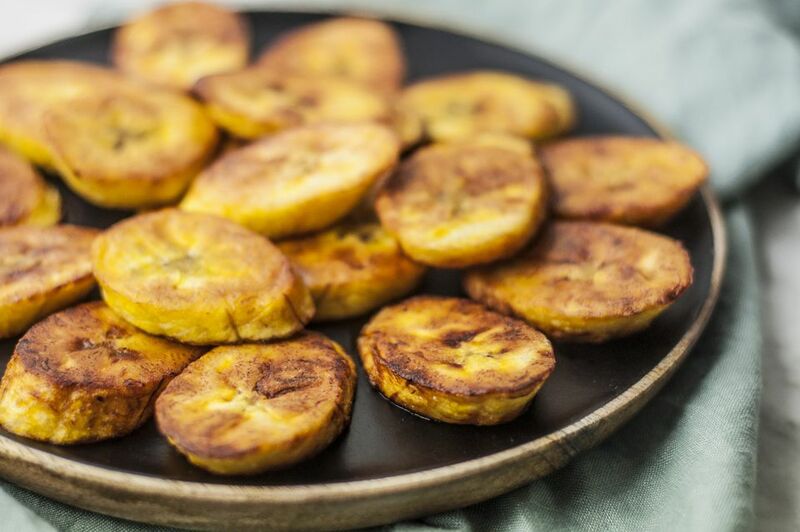 This recipe for fried ripe plantains makes one of those ubiquitous Caribbean dishes that's served with almost every meal and is a hit with West Indians and non-West Indians alike. The key to a successful end-result is to ensure that the ​plantains are to the right degree of ripeness. The skin should be almost black or, in some cases, have a dull yellow color with patches of black. The riper it is, the sweeter it is for the perfect fried ripe plantains. In addition, to being sweeter, ripe fruit peels easily and cooks in no time. Take these tips to mind when you cook plantains. Drizzle just enough oil into a nonstick skillet to coat the bottom of the pan and place it on medium heat. When the oil begins to shimmer, but not smoke, add plantains (work in batches) and fry for 1 1/2 minutes on one side, flip and cook for 1 minute on the other side. Remove plantains from pan and drain on paper towels. Continue frying in batches until all the plantains are fried. Sprinkle lightly with sea salt to give a sweet and salty taste to your fried ripe plantains. The Right Pan: Use a nonstick skillet as this will aid in the easy release of the cooked plantain from the pan. Remember that sugar burns quickly and sticks. Given the high sugar content in the ripe plantains, a nonstick skillet is an excellent pan choice. The Right Oil: Use a neutral-tasting oil such as canola or vegetable oil. The amount of oil used for frying should be just enough to coat the bottom of the pan. Too much oil will cause the plantains to soak up the oil resulting in soggy plantains. After frying each batch, drizzle additional oil if needed. The Right Heat: Use medium heat to fry the plantains. You may have to lower the heat depending on the size of your stove burner and pan. If you don't, your plantains can burn in no time or brown too quickly. Fried ripe plantains can be found not only on tables throughout the Caribbean but in other parts of the world. Some people prepare it to accompany every meal while others make it accompany specific meals. For example, in the South American country of Guyana, fried ripe plantains are traditionally served with one of their national dishes, cook-up rice (rice, beans, and meat cooked with coconut milk). The varying degrees of ripeness is evidenced by the color of the plantain's skin which can go from cream to bright yellow to dull yellow with patches of black to completely black. For excellent fried ripe plantains, you'll want to choose a plantain that has a dull yellow skin with patches of black or completely black—this indicates a plantain is at its peak of ripeness. A plantain at its peak of ripeness has exchanged all of its starch for natural sugars; frying it at this stage of full ripeness brings all the sugar to the surface, hence the brownness of fried ripe plantains and the wonderful taste notes from the caramelization. When frying ripe plantains, you are coaxing the sugars to the surface of the plantains. This is another reason why people opt to cut the ripe plantains diagonally—it provides a larger surface for caramelization.